This tasty salad works well as a light main dish for brunch, lunch, or as a festive spring side dish. Put asparagus into a large skillet of salted, boiling water. Boil until tender-crisp, about 3 minutes. Drain well; spread on paper towel to cool. Meanwhile, to make aioli, mix mayonnaise with olive oil, water, lime juice, and garlic; reserve. Over a piece of wax paper or paper towel, force egg through a sieve with the back of a wooden spoon, making sure to scrape off the egg that clings to the underside of the sieve. 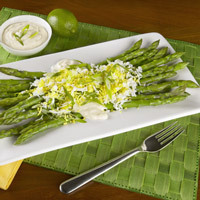 Arrange asparagus on a platter, then drizzle with reserve aioli. Sprinkle with egg, then green onion. Lightly season with salt.